Click HERE to view the Interactive Gate Valve Demo in your Browser. Your Computer and Browser must support WebGL. In the demo use R-Mouse drag to orbit the view / Mouse wheel to zoom the view. 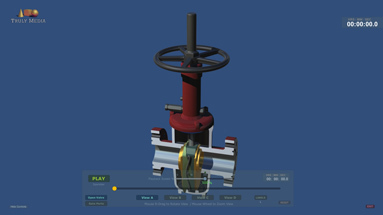 Click HERE to download the Interactive Gate Valve Demo to your computer. 1. Extract the zipfile that you downloaded on to your computer hard drive. This will create a folder on the drive called 'Truly Media'. 2. Open the Truly Media folder and double-click the EXE file to run the interactive demo. 3. Choose the desired screen size & click PLAY. 4. The demo will begin. ***NOTE: A modern computer is required to play the interactive demo. Older computers may give poor results or not play at all. Turn OFF all other apps before playing to ensure best results.